Shooting comes less than 24 hours after one was killed in a cafe shooting. A person who was shot in the head in an attack near a Copenhagen synagogue has died, Danish police said tonight, but there was no word on whether that incident, in which two cops were also wounded, was related to another fatal shooting earlier in the day. The shooting tonight, in which two police officers were also wounded, occurred just hours after a gunman killed one person and wounded three cops at a free-speech event at a café in the Danish city, police said. 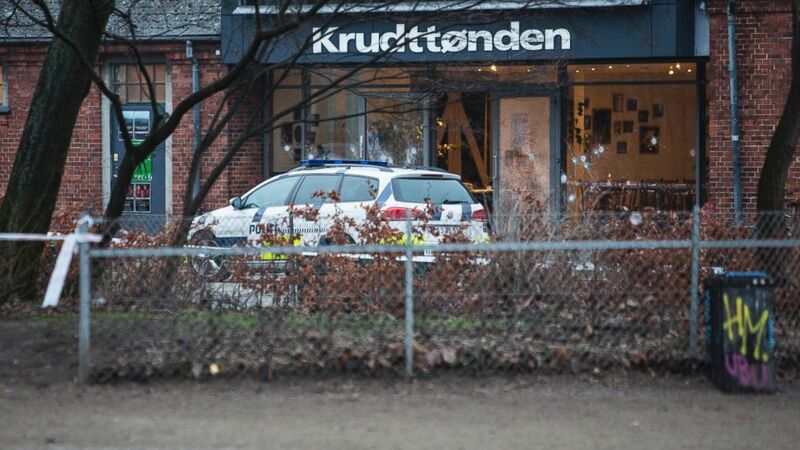 Police were looking for at least one gunman in that attack at the Krudttoenden cafe, which Danish officials described as terrorism and an assassination attempt. 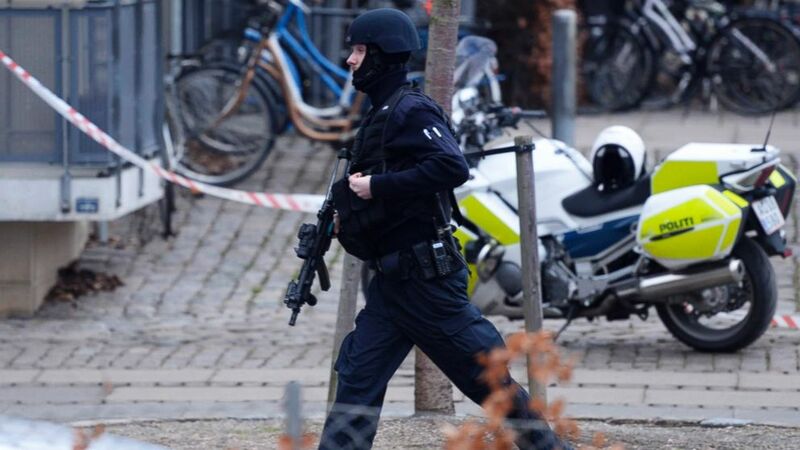 "We feel certain now that it is a politically motivated attack, and thereby it is a terrorist attack," Danish Prime Minister Helle Thornin-Schmidt said of the cafe shooting. Police tweeted early Sunday local time that officers shot a man at the city's Norrebro train station, but did not say whether it was connected to the shootings at the synagogue and the cafe. They also said the condition of the person shot was unknown. At a news conference late Saturday night, police asked residents to respect road blocks set up around the crime scenes, but said there is no curfew or lockdown in the city. Officials also said that residents should continue about their regular routine as there is a "massive presence of police in Copenhagen." Police initially said they were looking for two shooters in the attack at the cafe, but after interviews with witnesses they said they believed there was only one. They released a security photo of the suspect, showing a man in a dark coat, with what appeared to be a reddish hat and scarf covering much of his face. 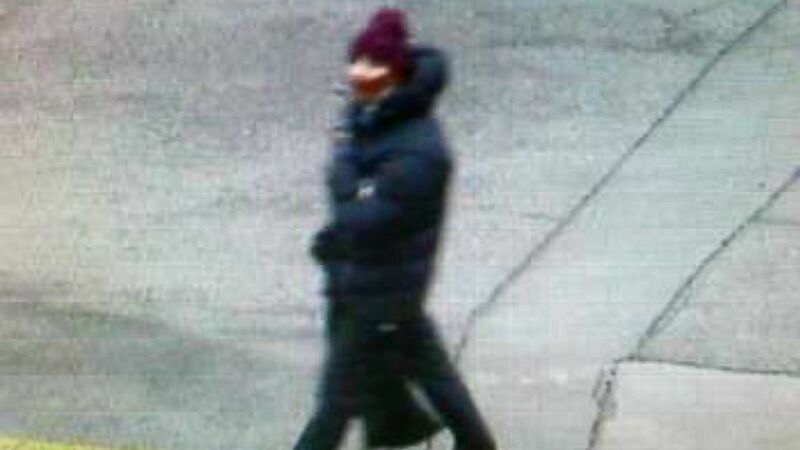 (Copenhagen Police) Police in Copenhagen released a photo of a man believed to be the gunman who opened fire on a cafe in the Danish city, killing one man and injuring three police officers. The shooting happened about 4 p.m. at an event titled "Art, Blasphemy and Freedom of Expression," organized by Swedish artist Lars Vilks, who has faced several threats after caricaturing the Prophet Muhammad. "I'm not sure how many shots but I'd say about 20 or 30 shots," sais Dennis Myhoff-Brink, who witnessed the attack . "And, people panicked of course and ran to the doors. Other people were hiding behind tables they had turned over." Vilks, 68, who was not injured in the shooting, said he believed he was the intended target. 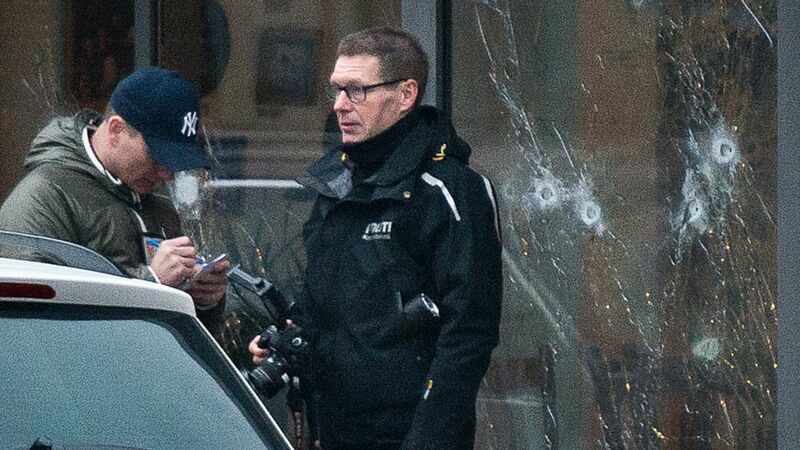 (Polfoto, Janus Engel/AP Photo) The scene outside the Copenhagen cafe, with bullet marked window, where a gunman opened fire Saturday, Feb. 14, 2015, in what is seen as a likely terror attack against a free speech event organized by an artist who had caricatured the Prophet Muhammad. "What other motive could there be? It's possible it was inspired by Charlie Hebdo," he told The Associated Press. The shooting happened a month after gunmen opened fire on the Charlie Hebdo satirical magazine in Paris, killing 12 people. The windows of the cafe were riddled with dozens of bullet holes, reported Danish news channel TV2. The conditions of the three officers injured were not released by police, according to the AP. The 40-year-old victim was not identified. While no one has claimed responsibility for the shooting, one of the organizers, Helle Merete Brix, told the AP she felt Vilks was targeted. "I saw a masked man running past," Brix said. "I clearly consider this as an attack on Lars Vilks." (Kenneth Meyer, Polfoto/AP Photo) An armed security officer runs down a street near a venue after shots were fired where an event titled "Art, blasphemy and the freedom of expression" was being held in Copenhagen, Saturday, Feb. 14, 2015.